Have you ever been concerned that someone knows more about your business than you have openly shared? If this is the case, then it is possible that you have been a victim of a bugging device. Read on to find out whether you need technical surveillance counter measures or TSCM service today. Everyone within the business world knows that if you want to be a market leader, there are certain pieces of information that you don’t share openly. This could be anything from the wages of your top staff, to your latest invention, or how you plan on winning the next big bid. However, there are people out there who are willing to go to extraordinary measures to find out this type of information, and this includes using cameras and listening devices to bug your offices or place of work. A sure sign that this is happening to you is interference on your phone line, or your phone making unusual noises even when it isn’t being used. Another sign is unusual activity on your computer systems. Disappearing files, changes in passwords, codes, and even screen changes can be hints that data has been accessed or corrupted. Aside from this, you should be on the lookout for changes in your staff. Changes in behaviour or routine could suggest that they are collecting and passing on information, either by choice or under duress after being under surveillance themselves. These signs coupled with unusual amounts of private information becoming public mean that you should consider counter surveillance measures. The most effective way to do this is to use a TSCM service. At Advanced Sweeping, we take our TSCM services seriously and aim to repair your security and privacy as soon as possible. Our highly trained team will work overtly or covertly, as suits you best and are always available at short notice. 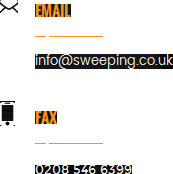 For more information on the expert services that we provide go to http://sweeping.co.uk/.